Every year in the UK in the lead up to Easter, it’s a bit of a tradition (okay, it’s a BIG tradition) that the chocolate manufacturer Cadbury do a number of innovative / intriguing and sometimes infuriating adverts for their Creme Egg product. This 4 week out-of-home specials campaign that started Monday 12th January, with JCDecaux’s Innovate was booked through PHD and executed by Hyperspace, the innovations division of Posterscope. Richard Simkins, Senior Project Manager at Hyperspace told us “This campaign is a great example of the creativity and innovation that is possible in out-of-home. It is perfectly aligned to the online and TV activity while allowing the consumer to engage with the Creme Egg message in the real world. We have high hopes that this will be the most successful campaign of its kind.” and you know what? He may be right with regard its ‘success’ – this is so cool and really engaging! 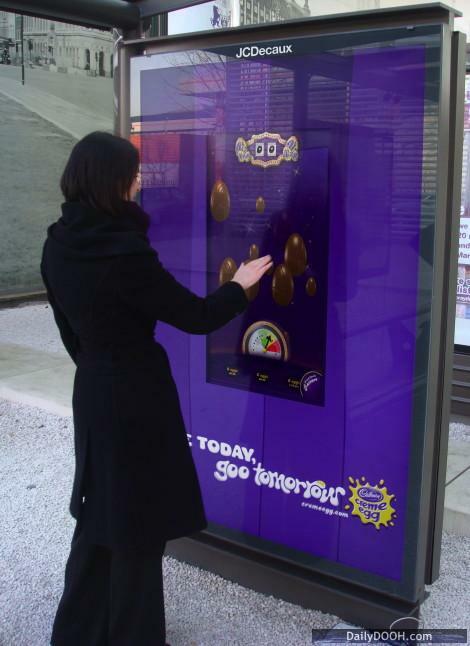 Basically passengers at UK bus stops are encouraged to ‘Goo the egg’ on the especially designed interactive game that runs on the digital bus shelter screens. Gamers win points for gooing Creme Eggs. The campaign is likely the largest ever game to be played on touchscreen bus shelters – there will be 20 sites across London, Birmingham, Nottingham, Sheffield, Manchester, Glasgow, Sheffield and York. The campaign of course is designed to raise awareness of the limited availability of Creme Eggs in the run up to Easter and will enrich and amplify the TV campaign that is currently running. The out-of-home activity is also aiming to drive players to the website www.cremeegg.co.uk where a selection of other games and interactive features, including online voting for the favourite TV ad, can be found. In addition to the 20 bus shelter specials from JCDecaux, the outdoor campaign includes 6-sheet and some bus advertising. The creative agency was Saatchi & Saatchi. It’s unclear at the moment the exact details of the software and hardware technology being used. It seems that JCDecaux managed the construction of the unit themselves and it may well essentially be their own IP. What we do know is that the unit was (specifically) designed to place the Flash game itself, and connect wirelessly (at least short range) to JCDecaux devices which are able to track uptime, usage data etc. etc. This entry was posted on Wednesday, January 14th, 2009 at 16:25 @726 and is filed under DailyDOOH Update. You can follow any responses to this entry through the RSS 2.0 feed. You can leave a response, or trackback from your own site. Im just amazed at that digital screen… never seen anything like it. Very clever campaign though.